The first hogs known as Herefords originated on the farm of R.U. Webber of La Plata, Missouri. Mr. Webber was said to have made his first crosses in about 1902, and these ultimately involved several breeds. He is quoted in an article in the Journal of Heredity by Anderson and Bonsma as having said his hogs were "a cross of white and red-blooded stock Duroc, Chesters and OIC's (Ohio Improved Chesters) and a peculiar blood strain on graft." It is reported by the secretary of the National Hereford Hog Record Association that Mr. Webber did not cooperate with breeders that obtained his original development, and none of the present-day Hereford Hogs trace to the Webber blood lines. These men had definite goals in mind as to type, color, conformation, superior feeding qualities and other favorable characteristics to develop their foundation stock. Both Duroc and Poland China blood lines were used to considerable extent in a judicious program of crossing, inbreeding, interbreeding and selecting to develop superior foundation stock. In 1934, about one hundred animals were selected as foundation stock. These were from the herds of John Schulte, Noway, Iowa; Lunt Brothers, New Sharon, Iowa; A.J. Way, New Sharon, Iowa; Henry Weimers, Dillen, Nebraska; G.P. Rue, Nickerson, Nebraska; and P.W. Mitchel, Van Meter, Iowa. The Color Pattern. In order to be registered in the National Hereford Hog Record Association, an entrant must ". . . have a white face, not less than two-thirds red exclusive of face and ears, with at least two white feet - white showing not less than one inch above the hoof. They must be red in color, either light or dark red." The shade of red may vary from light to dark, but a deep red color is preferred. An animal that has a white belt or carries more than one-third white, exclusive of the head and ears, is not eligible for registration and cannot be exhibited. Hogs with swirls are not eligible for registration. Conformation and Size. The Hereford should have the same general body type or conformation as hogs of other major breeds. The Hereford hog has a medium length of face with a slight dish and carries a drooping ear of at least medium size. It is not as trim about the jowl and has a longer neck than most breeds. The advocates of the Hereford breed maintain that, although a relatively new breed, it is prepotent and breeds quite true in color pattern. It is stated in the association publications that at least 90 percent of the offspring of well marked Herefords carry acceptable color markings. 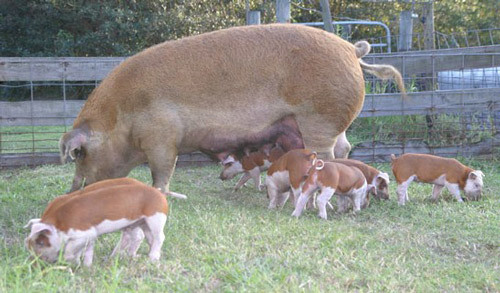 The sows are prolific and good mothers and compare favorably in these respects with those of other breeds. Hereford hogs are fair grazers, good feeders and they fatten readily.